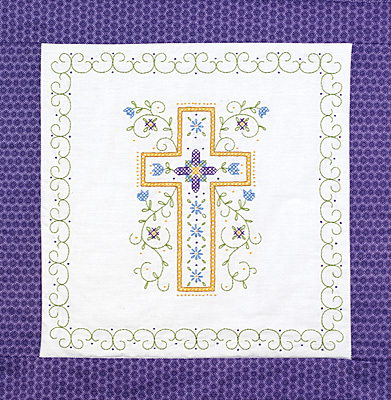 Religious Cross Quilt Blocks are one of our NEW additions. 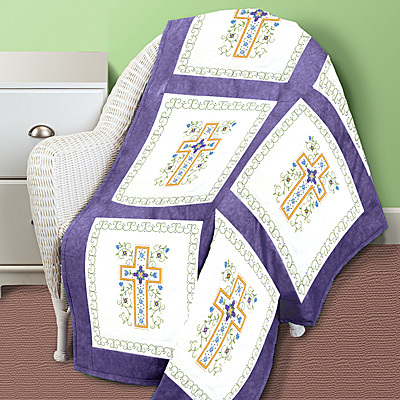 These quilt blocks can be accented with our Religious Cross Dresser Scarf or the Religious Cross Pillowcase Pair. All three combined make for a beautiful set. Contains: 6 screen-printed 18"x18" 45 / 55% polyester / cotton broadcloth blocks, needle, graph and multi-lingual instructions. Designed by Sandy Garbrandt and made in the USA by Janlynn. Floss not included. Finished size: 15"x15" ea block. Lap Quilt: 2 panels of 3 blocks. Twin: 5 panels of 6 blocks. Full / Queen: 7 panels of 6 blocks. King: 9 panels of 6 blocks.